Whenever you work in a professional pastry kitchen, especially one that emphasizes seasonal ingredients, it's always an incredible pleasure to greet each new delivery of fresh fruit. The shocking palette of deep reds, sunset pinks and oranges, and deep purples of spring brings an especially huge rush of excitement about the rotation of menu and the pure joy of working with and presenting such gorgeous specimens. We are at that precise blissful moment of the year to celebrate the unique sweet tart combination of fresh strawberries and rhubarb, the two bright red harbingers of spring. Strawberry Rhubarb Pie, prepared in New England and the South since the mid-1800s, is one of my favorite pastries. I hope everyone takes the opportunity to bake at least one this season. Mmmmmm, pie. This time out, I'm doing a simple pudding cake that isn't terribly complicated but makes a nice and fairly light warm dessert. For those who fear the pie crust (and you know who you are! ), this one doesn't involve a rolling pin. Since this dessert is baked a far shorter time than pie, the rhubarb gets cooked a bit on the stovetop with sugar, orange zest and a splash of vanilla to tenderize a bit and release its juices. As it cools, toss in a good haul of sliced strawberries. Blend the dry and liquid ingredients together and lighten the whole mix by folding in whipped egg whites. 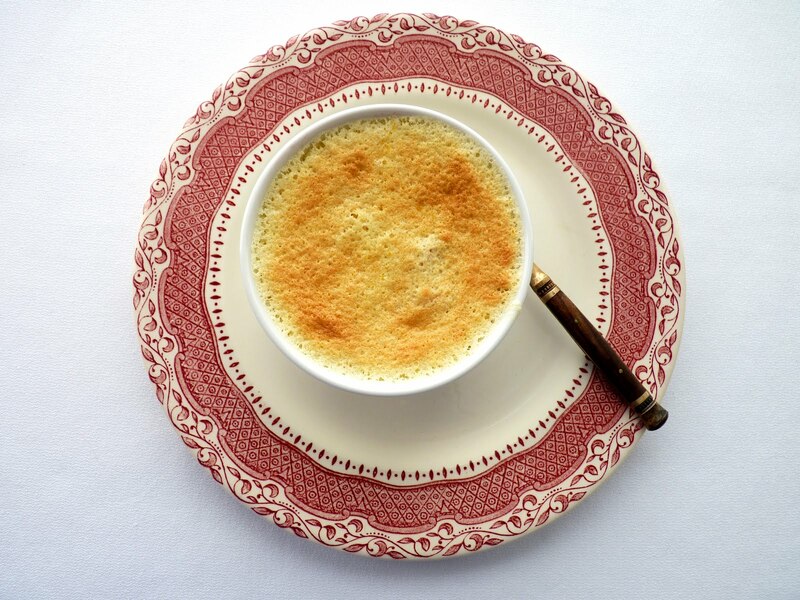 Then bake the cakes in a bain marie, which is the French pastry term for "water bath." 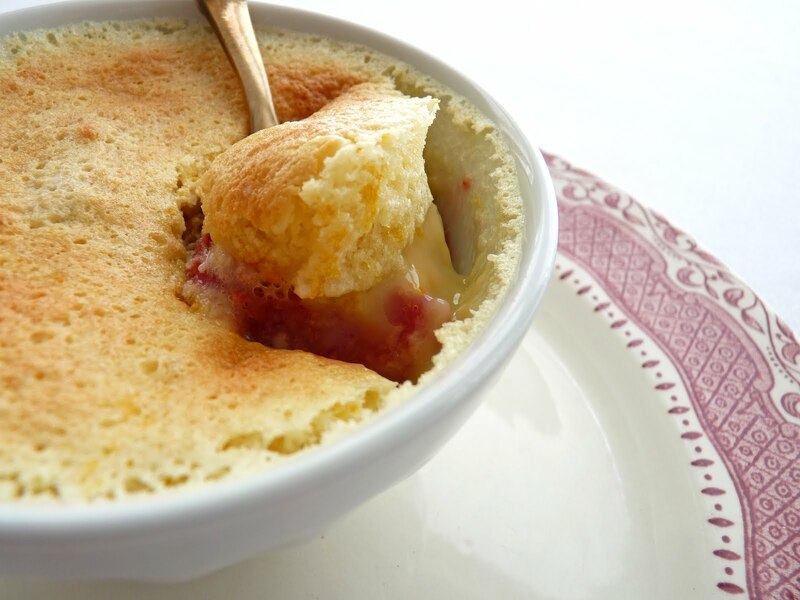 This method ensures slow, even cooking, an important measure when baking custards and puddings that contain eggs. The cake is very light and spongy and the fruit is tender and luscious, best served warm on a cool spring evening. - The cooked rhubarb may taste sweet but the added strawberries don't have any additional sugar. - When beating egg whites, whip them until they look foamy and opaque, then add sugar slowly. Continue beating until they form stiff peaks when the whisk is lifted. They should be shiny and smooth. If they start to lose their shine and look grainy and a bit craggy, you've gone too far. 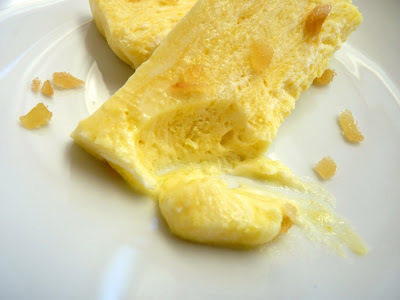 - Because the cake batter is very thin, stir or gently whisk in 1/3 of the egg whites to create a thicker base to fold in the remaining egg whites. -I find it easier to handle the water bath and the ramekins if I use two smaller pans instead of one large one, which can sometimes be too heavy or awkward to maneuver. This reduces the risk of spills or splashes. Preheat oven to 350 degrees. Lightly butter six 6-ounce ramekins. Put on a large pot of water and bring to a light simmer to use for the water bath. Place the sliced rhubarb in a saucepan with the sugar, orange zest and vanilla. Cook over medium low heat for about 10 minutes or until the fruit softens. 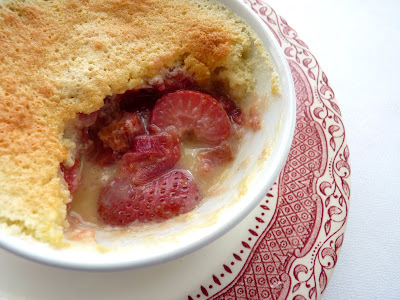 Slice the strawberries into bite-sized pieces and combine with the rhubarb. Distribute the fruit equally among the six ramekins. 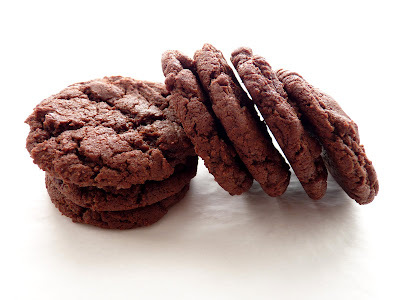 Set aside 2 tablespoons of sugar and whisk the remaining sugar with the flour and the salt. In another bowl, whisk together the milk, lemon juice, orange zest, vanilla and egg yolks. Whisk in the melted butter until thoroughly blended. Combine the liquid with the sugar and flour mixture and whisk until smooth. The mixture will be very thin. Beat the egg whites with the remaining 2 tablespoons of sugar until stiff peaks form. Portion a third of the egg whites and stir into the cake batter until it thickens a bit. Using a rubber spatula, gently fold in the remaining egg whites one-third at a time. Pour equal portions of the batter over the fruit in the prepared ramekins and place them in a large roasting pan or two smaller pans. Place the pan(s) in the oven and pour in enough hot water to reach halfway up the sides of the ramekins. Bake the pudding cakes for about 25 - 30 minutes or until they are puffy, golden and spring back when touched. Carefully transfer the ramekins to a rack. Serve warm or at room temperature. Spring has arrived! There's more variety of fruit available at the markets this week. I’m patiently waiting just a bit to let the season unfold with more ripened specimens. But I’ve got blueberries on my table once again and they are really juicy and delicious. This time they found their way into a great little brunch or dessert cake from Abigail Johnson Dodge. It’s an easy recipe that delivers a very tender cake with a topping of beautiful fresh fruit. There’s a slight texture of cornmeal and a tang of lemon, buttermilk and fresh blueberries, which is definitely a winning combo in my book. The recipe is very good as is, but I wanted the fruit to be jammy. So rather than follow the instructions for the blueberries, I cooked them just until juicy, gave them a spritz of lemon and set them aside to cool. I placed dollops of them into the cake batter and baked the cake. Then I spooned the remainder of the compote over the top of each slice as it's served. 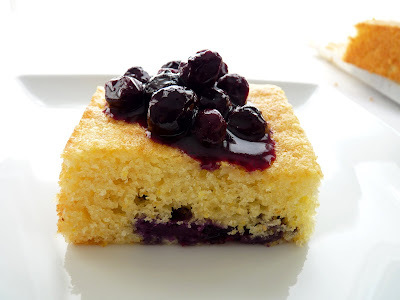 If you desire a really wonderful burst of blueberries, this is a great way to play it out - a bright yellow cake with the deep ink stain of blueberries to dazzle your table. Super simple and truly satisfying. - I use a 9” square pan and bake the cake for 26 minutes. Line it with an overhang of parchment to make it easy to remove. 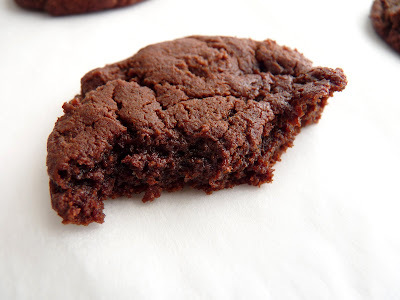 - I wanted a little bit more texture and corn flavor so I changed the ratio of flour and cornmeal just a little bit. I used 1 1/4 C flour and 1/3 C cornmeal. - If you’d like to replicate my changes for the blueberries, prepare the filling as follows: 1 1/2 C fresh blueberries; 2 T – 2 1/2 T sugar, to taste; 1 1/2 T water; 1/2 star anise; 3/4 t cornstarch + 3/4 t cold water; 3/4 t lemon juice. Place the blueberries in a saucepan and add sugar, water and star anise. Simmer on low heat for 2 – 3 minutes. Dissolve the cornstarch in the water and stir into blueberries. Add the lemon juice. Cook for another 2 – 3 minutes, stirring to keep from scorching. Remove the star anise and set aside to cool and thicken. When you’ve poured the cake batter into the prepared pan and smoothed it out evenly, dollop a tablespoon of the filling into the cake batter in 8 – 9 places. 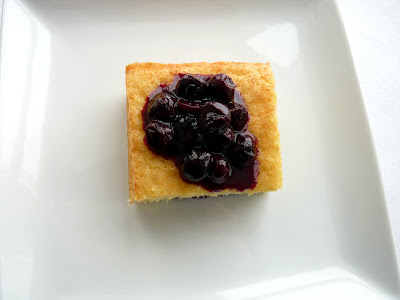 Reserve the remaining blueberries to garnish the cake slices. - Finely ground cornmeal works best in this cake. The result is a really tender crumb. - When you add the lemon juice to the cake batter it may appear curdled. Don’t worry; it will all come together when you add the dry ingredients. Preheat oven to 350 degrees. Lightly butter a 9" x 2 1/2" cake pan and line the bottom with parchment. Whisk together the flour, cornmeal, baking powder, baking soda and salt. Beat the butter, sugar and lemon zest until fluffy, about 3 minutes. Add the eggs, one at a time, beating on medium speed until thoroughly blended and scraping the bowl after each addition. Add the lemon juice and combine. Scrape down the bowl. Lower the speed and add half the dry ingredients. Mix just until it starts to blend together. Add the buttermilk and combine. Add the remaining dry ingredients, mixing just until there are a few flour streaks remaining. 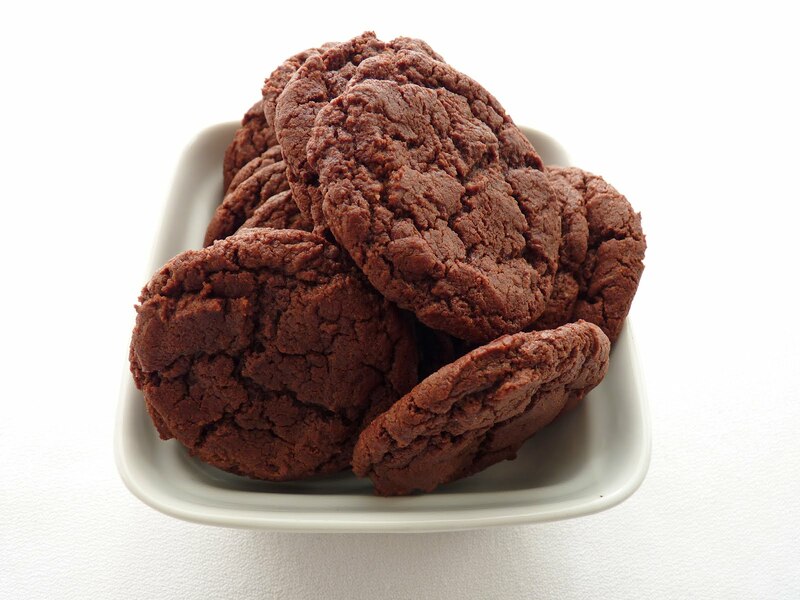 Finish the mixing by hand using a rubber spatula, making sure you've thoroughly scraped the bottom of the bowl. Pour the batter into the prepared pan and spread evenly. Bake for 15 minutes. Meanwhile, make the topping. Combine the blueberries, sugar and flour in a small bowl. 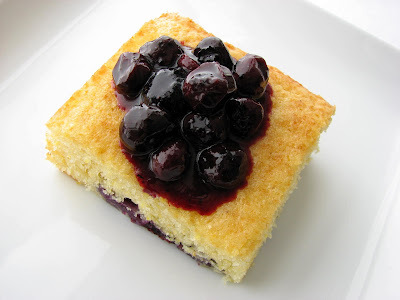 Mix together, lightly crushing the blueberries and evenly coating them with the flour and sugar. 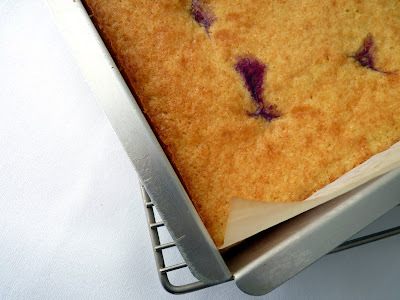 After the cake has baked for 15 minutes, slide the oven rack out and quickly scatter the blueberries evenly over the top of the cake. Discard any flour and sugar that doesn't adhere to the berries. Continue baking until a toothpick inserted in the center of the cake comes out clean, about 23- 25 minutes. Let the cake cool on a rack for 10 minutes. Run a knife around the edge of the cake and invert the cake. Lift the pan off and peel away the parchment. Lay a flat serving plate on the bottom of the cake and invert again. Serve warm or at room temperature. Back in the wonderful days of pastry school – that time in my life when I fell in love with the creativity of working with so many incredible ingredients and techniques - our curriculum was divided into types of pastry and dessert, grouped by method. Each lecture began with an overview of the history and classical technique for categories of tart doughs, foam cakes, butter cakes, tortes, laminated doughs, creams and custards, breads and crackers, and on and on. We learned about the how and why of what makes these techniques work and the balance of ingredients necessary to make delicious pastry. I was spellbound. produce really delicious flavors. Along with all the other enchanting things in the pastry universe, it's become one of my favorite things to do. Even the mistakes are fun. Semifreddo is another one of those surprises. Until pastry school, I really had no idea what it was all about. 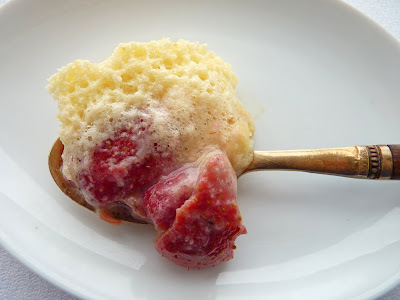 Essentially, it's an Italian take on frozen dessert and a great way to enjoy ice cream without needing an ice cream maker. It has the lightness and texture of a frozen mousse, which is ethereal. 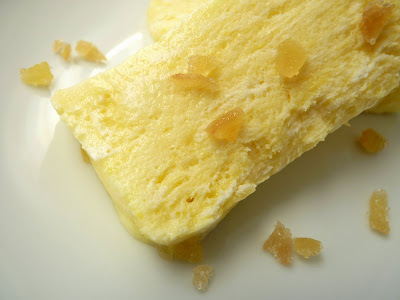 The Lemon Ginger Semifreddo I'm writing about today is a very good and simple example of how easy and delicious this dessert can be. It starts with a lemon curd. For a nice flavor counterpoint, I steep some fresh ginger in warm cream. 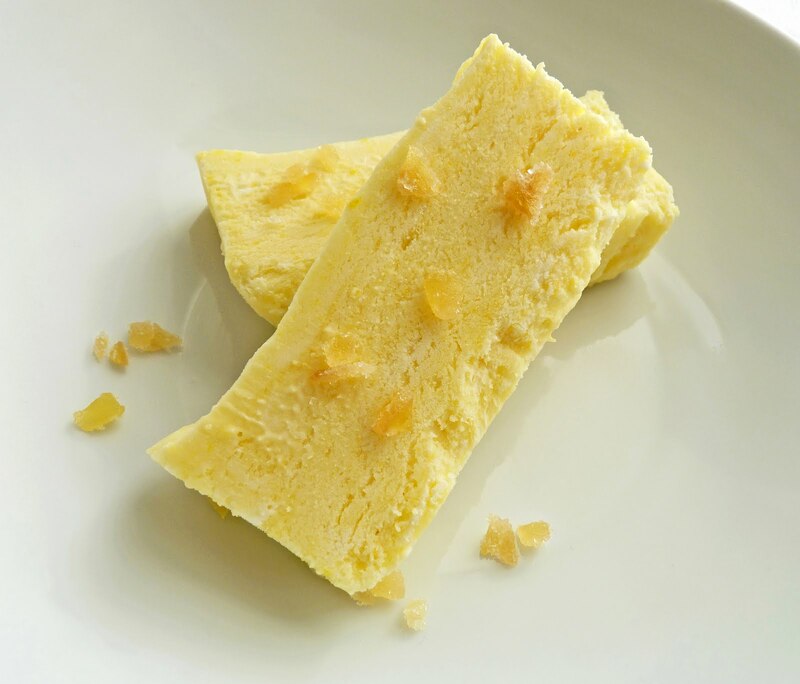 The flavored cream is chilled, then softly whipped and folded into the lemon curd along with some meringue to form large billows of heavenly mousse. Place all that in the freezer for a few hours and voila! 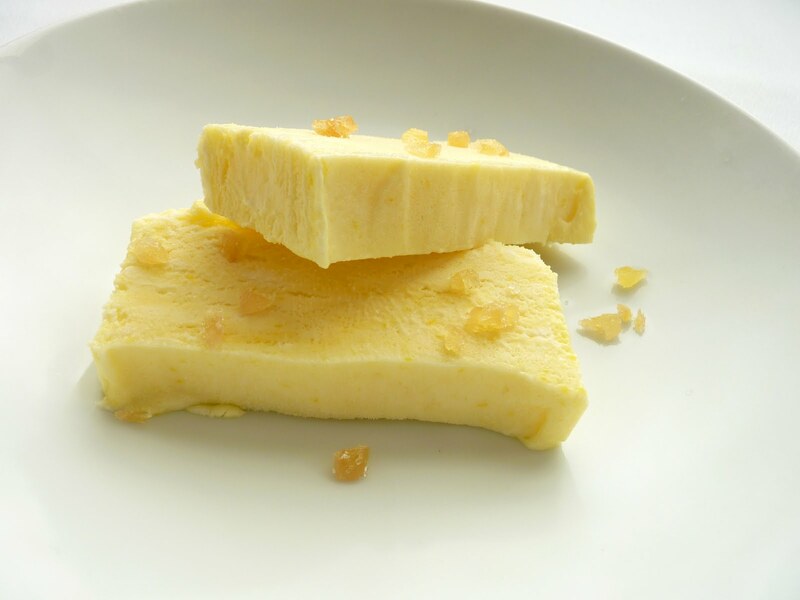 Lemon Ginger Semifreddo. - I like lemon curd on the puckery side. If you want a sweeter version, increase the sugar to 3/4 cup and cut back on the zest to one lemon. - Lemon curd can be made ahead and refrigerated up to 3 days. - Ginger slices should be about the size and thickness of a quarter coin. 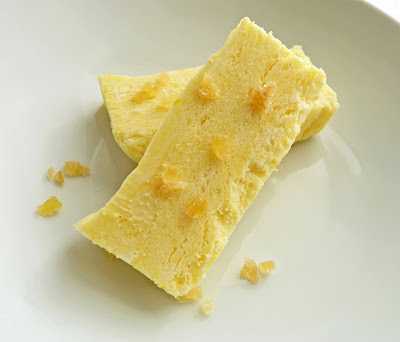 - If you don’t care for ginger, omit it and serve the Lemon Semifreddo with fresh crushed and sugared berries and/or press toasted sliced almonds on top. - Another absolute favorite is super delicious Pistachio Semifreddo, which is a simple combination of pistachios, meringue and whipped cream folded together with a splash of almond extract. For the lemon curd, whisk together the sugar, egg yolks and whole egg in a heatproof bowl that will fit over a water bath. Whisk in the lemon juice and zest. Place over a double boiler or bain marie of simmering water, making sure the bottom of the bowl isn't touching the water. Cook until the curd thickens, stirring constantly. Pour the curd through a metal strainer into a clean bowl. Cut the butter into small pieces and add to the curd. After a minute or so, stir in the butter to combine thoroughly. Press a piece of plastic wrap onto the surface. Set aside and cool to room temperature. Place the heavy cream and ginger slices in a saucepan over low heat and bring to a simmer for a couple of minutes. Take off the heat, cover and steep for about a half hour while the lemon curd is cooling. Once the cream has steeped, remove the ginger and pour into a bowl. Place in the freezer for about 15 minutes to chill. Prepare an 8 1/2" x 4 1/2" metal loaf pan by lining with plastic wrap, leaving a generous overhang on all four sides and smoothing it out as much as possible. 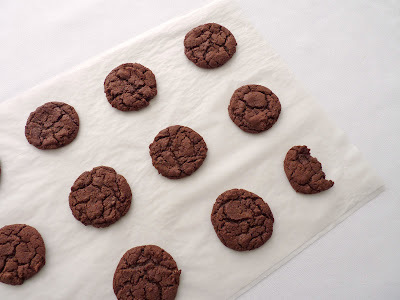 You can also make a strip of parchment paper with an overhang for the long sides and place on top of the plastic to help form smoother sides. Beat egg whites until they are opaque and hold soft peaks. Slowly add 1 T + 1 t sugar and beat until meringue holds stiff, glossy peaks. Whip chilled cream with 1 T sugar until it just holds soft peaks. Pour cooled lemon curd into a larger bowl and stir to loosen. Using a large rubber spatula, gently fold in whipped cream. Then fold in the meringue until there are no obvious streaks of white. Pour into prepared pan and smooth the surface. Fold over the parchment (if using) and plastic wrap on top to cover. Place in the freezer for about 6 - 8 hours or overnight. To serve, run a thin knife or small metal spatula around the edges of the pan to loosen. Unwrap the plastic and parchment (if using) from around the top of the pan. Place a serving plate on top of the pan and invert. Carefully pull off the remaining wrapping. Slice with a sharp knife and serve immediately. Garnish with finely chopped crystallized ginger.